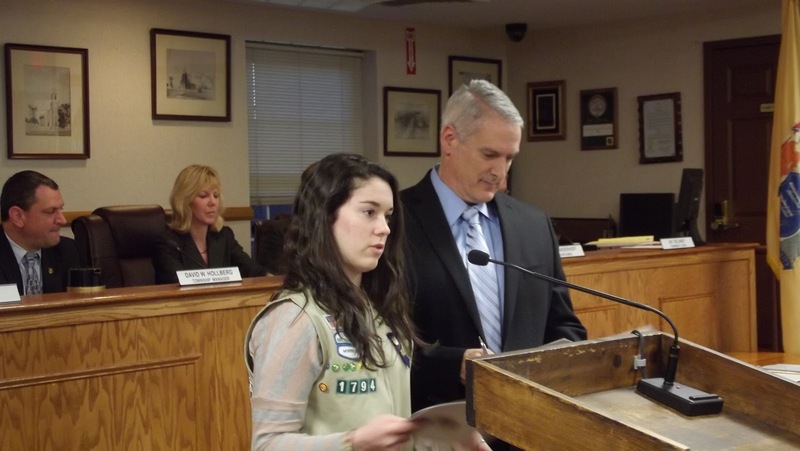 Pequannock resident Melanie Daniel recently received her Girl Scout Gold Award for completing a historic atlas of homes in the township, to be used as an aid in walking tours. On Tuesday March 27th, Miss Daniel also received the gratitude of the township in a public ceremony before the township council. Acting as spokesperson, Mayor Richard Phelan noted the dedication that a project such as this requires. Also present were Pequannock Historic District Commission Chairperson Jay Wanczyk, Corresponding Secretary Christopher Lotito, and Member Lou Hebert. Historic District Commission Liaison, Councilman Ed Engelbart, offered his congratulations as well. Engelbart, recently appointed township historian, was instrumental in the revision process of the walking tour, though he noted he received the project only when it was nearly complete. The walking tours are an excellent addition to Pequannock's growing list of historic tourism elements, which now include the Pequannock Museum located at the Pompton Plains Railroad Station on Evans Place, the historic Pompton Dam and Pequannoc Spillway as well as other elements of the Morris Canal, the Landsberger Holocaust Collection at the Pequannock Library, and a host of historic homes, inns, and stores too numerous to mention. One standout among that last is Jones Hardware, a working general store that has been in operation since they used to drag a board to flatten out the mudded main street each Spring. Shopping in Jones Hardware is a step back in time that is not to be missed as one strolls the brick paved sidewalks of Pequannock.